Congratulations on your purchase of this precision audio component and thank you for your selection of Parasound. 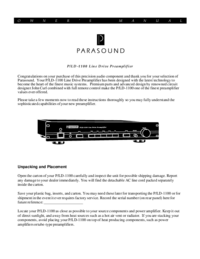 Your P/LD-1100 Line Drive Preamplifier has been designed with the latest technology to become the heart of the finest music systems. Premium parts and advanced design by renowned circuit designer John Curl combined with full remote control make the P/LD-1100 one of the finest preamplifier values ever offered.